Video to YCbCr / RGB Sync on Green Converter Convert Composite Video or S-Video signal such as iPod, DVD, X-Box to component connection or RGB Sync on green for connecting to SDTV or projector. This converter is designed to convert video input signals of NTSC, PAL and SECAM, to high quality PC and DVI output. This HDMI Repeater enhances your long distance HDMI signal transmission by decoding and re-encoding the signal to a new standard, capable of re-transmitting across another 12m without degradation or loss. This DVI with Digital Audio to HDMI Converter combines your digital video (DVI) and audio (SPDIF) input and converts it to HDMI output. The main purpose for this is to combined the digital video and audio into one stream. 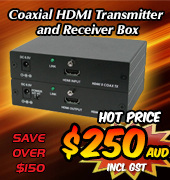 This HDMI Extender Equalizer is a high grade professional booster/enhancer box for use between 2 HDMI devices. This box will allow you to transmit high definition audio/video streams across long distance without any digital degradation. The DVI repeater corrector boosts DVI source signal and extends the range of DVI signal transmission over a copper based cable by 12 meter at 1080p/UXGA. 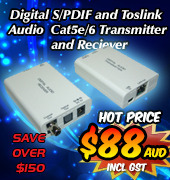 This HDMI Amplifier Equalizer is a booster/enhancer box for use between 2 HDMI devices. This box will allow you to transmit high definition audio/video streams across long distance without any digital degradation. High-performance professional video scaler CSC-1600HD , converting composite, S-video and YCbCr component video into high resolution computer and HDTV resolutions. The PAL or NTSC Video to PAL or NTSC Video Digital Converter is perfect for converting composite video NTSC, PAL or SECAM to an NTSC 3.58 or PAL output. The unit accepts a range of video inputs from NTSC, N4, PAL M and N and SECAM, converting all to either NTSC 3.58 or PAL (via a jumper on the PCB). A Digital TV In-Car Antenna that has an adhesive back for mounting to windscreens and is especially designed for car tuners. The antenna is fitted to the car tuner via the antenna's F connector. This is an great Digital Converter - 12v Car Model for converting composite video NTSC, PAL or SECAM to NTSC 3.58 or PAL output. 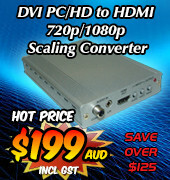 ProTV IV DVI TV (NTSC Version) is a high resolution TV tuner converter which can display Free to Air TV or Cable TV. It is also capable of converting video signals from VCR's, LD/DVD/VCD Players, V8, DV, Game Consoles and Set Top Boxes to output onto PC monitors. The DVI to VGA Scaler Box is a high performance PC/HDTV two-way scaler that accepts Digital DVI-D input and converts to Analog RGB output. NTSC Colour Corrector CCR-7. This unit is designed for adjusting color quality of a video signal to achieve the best visual effect or copies of a videotape. This unit is only for NTSC to NTSC signal conversion. AV Stereo Selector CVD-1000. This switchbox allows the user to select one out of the four input A/V sources. The selected source is then amplified and split into four parallel outputs. SCART Sync Separator CSR-2200. This unit will enhance the picture quality of your tv by utilising the RGB input of your TV. SCART to PAL Converter CRS-2000. This unit will convert from a scart input to a SVHS or composite output with stereo sound. Due to the fact that this unit is powered, it is able to keep a constant steady video stream unlike the unpowered versions. This is thanks to the Video Stabiliser inbuilt into the unit. YUV to RGB Converter CM-333 / CYU-333. This unit will convert your YCbCr signal from say your DVD player or Digital TV box and converts it to RGBs Scart for use with your TV or Video Monitor. It also combines the sound from the YCbCr signal into the scart output. PAL or NTSC video to VGA or XGA Converter accepts video signals from video sources such as DVD players, gaming consoles and digital cameras through the standard AV port or S-Video port and can be displayed on higher resolution LCD and CRT monitors. The DVI Distributor 8 way is a 1 input 8 output digital DVI distribution amplifier that accepts a DVI signal input from a computer and 8 amplified outputs connect to 8 display monitors. The DVI Distributor 4 way is a 1 input 4 output digital DVI distribution amplifier that accepts a DVI signal input from a DVI source and the DVI output is re-shaped and re-amplified to allow connection to up to 4 display monitors. The DVI Distributor 2 way is a 1 input 2 output digital DVI distribution amplifier that accepts a DVI signal from a DVI source and the two DVI outputs are amplified to allow connection to DVI HDTV's. TV - PC Dual-Use DVB-T STB contains a VGA input and output port which allows the user to view quality digital programs.When the VGA input is connected to the VGA output of the host PC it enables the monitor output image to switch between the DTV programs and the PC data processing. This unit is a high speed portable digital HDTV capture box. The user can watch, record and play back high quality digital terrestrial TV program on their PC. The digital TV can also be received and watched while moving at a high speed. This DVB-T set top box gives the user the ability to record any free to air Digital TV program in DVD without loosing quality. The unit is small and portable and with USB 1.1 and 2.0 support it allows the user to enjoy DVB-Terrestrial program anywhere. Dual PAL or NTSC Video to RGB Converter - one way - with 12v Relay Switch lets you convert or upgrade your car's new LCD screen or navigation system to allow the viewing of video (DVD's, TV, Playstation 2, etc), as well has having the capability to use a reverse camera with this Plug & Play converter. The AVI to MPEG Converter with Terrestrial Digital TV - DVBT USB allows you to listen to digital radio (not DAB) and view digital video broadcasting with the use of an UHF/VHF antenna as well as convert AVI files into MPEG files. This converter will convert PAL at 50hz to NTSC , this is done via a scart input to a standard composite (AV) plug output. The scart input allows the maximum amount of inputs including RGBs inputs and standard AV or S-video inputs through adapter plugs. The unit is a PAL or NTSC to SCART Video converter allowing you to connect composite inputs with SCART output. Car Navigation Screen Dual Video PAL NTSC to RGB Converter allows you to convert or upgrade your car's new LCD screen or navigation system to allow the viewing of video(DVD's, TV, Playstation 2, etc), as well has having the capability to use a reverse camera with this Plug & Play converter. The IP Camera 3 has a built-in high-speed image and network processor and includes a high quality CMOS sensor with 6 infrared LEd lights that provide an image in the dark. This compact and portable Mini Video Player Recorder combines a digital video recorder, digital video player, photo viewer, audio MP3 player and card reader all in one unit. It enables the user to play their pre-recorded full-colour videos on a PC or TV, or pocket PC based PDA. The Cubix TV Box is a USB 2.0 Hi-speed TV box which is NTSC and PAL compliant. The features of the unit include a time-shift function, video encoding and DVD/VCD authoring. The Cubix Cubox Digital Diary provides the user with portable storage which can be used as a full-ranged memory card reader or as TV/AV display for motion or still files. The USB 2.0 High Speed TV Box is a USB powered TV receiver which will allow the user to watch TV on any notebook or PC.